While moving things to repaint the living room, Risa knocked a chimney from one of the five lamps on the mantel and made extra work for herself, picking up glass. She decided it was time to reduce from five to four lamps there anyway, so added a bit more work pouring oil from the chimney-less lamp into the wells of the other four, cleaning chimneys and trimming wicks as she went. Ma sat in her rocking chair, sewing by the light of the lamp on the table. The lamp was bright and shiny. There was salt in the bottom of its glass bowl with the kerosene, to keep the kerosene from exploding, and there were bits of of red flannel among the salt to make it pretty. It was pretty. Hmm! Risa rose up, putting the book aside, and stepped into the kitchen to rummage through the rag cabinet. Sure enough, at the bottom of the box, the forty-first and last rag was a handkerchief-sized hunk of red terrycloth. It would have to do. What size is "bits?" Laura didn't say. Taking the rag and a pair of scissors with her back to her chair, Risa reduced the rag to a pile of postage-stamp-sized "bits" (some were larger) and rose up and stuffed them, more or less equally divided, down the openings of the lamp wells, where they took up kerosene, became heavy, and sank. The effect was immediate, and she found it pleasing. Magnification, distortion and refraction give the illusion of "red" lamp oil! The four lamps would now make a pleasing accent for the ends of the long mantel. Risa cleaned the empty lamp base and put it away with the spare chimneys and wicks. Red oil is sold in stores, of course, but is not suitable for practical lamp work. The stuff is "scented," which is to say it stinks, making the atmosphere in the house even more poisonous than does clear oil. Sometimes the power is off after a storm comes in off the Pacific, and the lamps have a real place in the scheme of things, so the stench of their burning is tolerated. With "scented" oil it wouldn't be. D'ya s'pose they make such impractical lamp oil because they've seen pictures of lamps with red wells and are trying for the look without knowing how it was done? Or did the well-to-do have colored lamp oil in those days, but maybe with a better formula than manufacturers of today know anything about? She wondered. After painting the living room walls and ceiling with a roller (the next day she would see to the angled corners with a small brush), Risa put back the furniture and the lamps and built up the fire a bit. 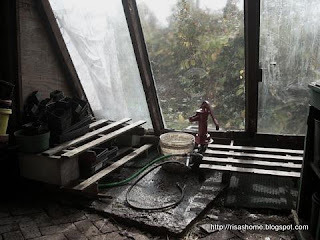 Rain was pouring from all the eaves and hammering at the ground round the foundations. On top of the woodstove she set a pan of potatoes in water to boil in their jackets, and next to it set the Dutch oven to preheat. She made up a batch of cornbread and poured it into a round cake pan and set the pan in the Dutch oven and covered it with the lid. After reading Laura Ingalls Wilder some more, she checked the cornbread (done!) and moved the Dutch oven to the warming shelf behind the stove. Then she checked the potatoes (just about done) and carried the pan into the kitchen, where she cut up some of them with onions, moved them to an oiled frying pan, and back to the woodstove. After she turned the potatoes a few times, she got a small trout from the refrigerator, where it had been thawing, shook it in a sack with cornmeal, and rolled out the trout into the frying pan. She turned the trout once, and the potatoes one more time. When Beloved came home, Risa told her about the lampwell trick from the Little House stories. "Let's eat by lamplight tonight," said Beloved. Early seedlings are underway in the house: two kinds of lettuce, two of cabbages, some kale, leeks, chard, favas and peas. This is by way of experimentation: first, how's the germination (some of these seeds are getting long in the tooth); second, assuming they result in good seedlings, how would some of these things do in the grow tunnel? There's still plenty of food from last year: fish, duck, chicken, lamb, broth, peas, green beans, potatoes, gallons of dried runner beans and favas, pie cherries, dehydrated apples and tomatoes and zukes, applesauce, tomato puree, winter squash, home brew, and one large pumpkin. There are stored apples, too, but they have to be taken on one at a time; many are mealier than they look due to a bad apple year -- the two trees that did set fruit aren't good keepers. We're done refurbishing the potting shed and are moving on to cleaning, sharpening and oiling tools. Oiling in this case means taking a rag, soaking a bit of vegetable oil into it, wrapping it around a wooden tool handle and giving it a good rubdown. Sun, more than rain, is the enemy of tool handles, and causes the wood fibers to separate -- develop long cracks that reduce the tensile strength of the handle and promote rot. Keeping them out of the sun when not in use is the best thing you can do, and oiling is the second best thing. I do this in the winter. Linseed oil is best but the veg oil seems to do okay. I'm dreadfully lazy and not much for filing most edged tools, knives and chainsaws excepted. I tend to take shovels and forks and bush hooks and such to the bench grinder, clean the blade or head with the rotary wire brush wheel, then go to the grinding wheel to touch up points or edges. This is not the best practice as the high speed grinder heats metal too fast, causing it to lose its temper (and thereafter not stay as sharp as it could be, hence the saying). But better treatment than most homeowner tools get nowadays in this country. And these tools have earned the treatment. We collected most of them in the 1970s. Some were hand-us-downs from decades before that. At least one fork is suspected to be from the nineteenth century. When I run the tangs of some of them over the wire wheel, a well-worn but still proud message -- Made in U.S.A. -- emerges from the caked clay. Then I return with them to the potting shed, which is warmer and brighter than the garage, and linger over the oiling. Maybe with Earl Gray steaming at hand? Maybe with a bit of Mendelssohn on the radio? Ah, and maybe both these and, shovel and oil rag momentarily neglected, watch and watch the antics of the redwing blackbirds, who are here two months and more early this year? Last year we threw a couple of eight foot one by sixes across three stacks of cinder blocks in the west window, and raised flats of vegetable starts here, including four kinds of tomatoes, three of peppers, and with a little less success, eggplants. We used sunlight almost exclusively, and somewhat prevented a "twiggy" epidemic by turning the flats regularly, and adding more planting soil as things grew. This activity, plus the fact that twelve cinder blocks were required to get things to the best height, wore on us a bit and so we are modifying our procedures somewhat. Utilizing a leftover slice from a 3/8 utility plyboard stiffened by two-by twos, and mounting above it a long, old-fashioned wooden curtain rod for clamp-lamp "grow" lights with daylight bulbs, we are able to span the entire width of the window, bearing the weight on a mere four cinder blocks. Currently in the window are some extra-early-early-early things: lettuce, chard, fava beans and yellow-podded peas. The favas were such a huge success last year that we assured ourselves of a place in fava heaven forever, only to have a complete crop failure from those we put in last fall. So we have two flats of them in the window as a combined germination test and, perhaps, replacement crop. They can be transplanted, albeit with much care in lifting. 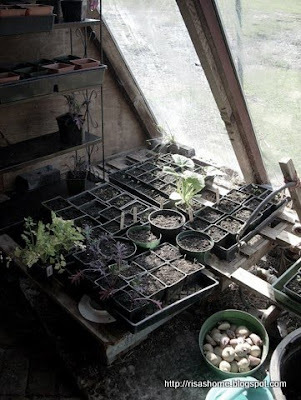 We make up the flats in the potting shed (this afternoon to the tune of Chopin's Preludes on KWAX), bring them in to the window, and if all goes well, will carry the full-sized starts first to the grow tunnel, then to partial shade, then to the garden. The lettuce and chard (this being the dead of winter) are wishfully destined for the grow tunnel itself. We shall see. This morning I marched with NAACP in town, but returned home earlier than last year, drawn by the quiet weather to putz about in the reorganized potting shed. Beloved, who has a day off courtesy of the holiday, and having very few vacation days for the next while, as she is re-starting her library career, is also relishing the interlude. 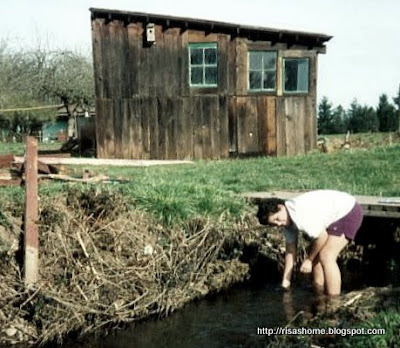 She has walked to the river and back, and now is meditatively spreading barn litter over garden beds. Later, perhaps, tea by the west window. Grow tunnel report: we ate all the lettuce, mizuna and spinach early on, and had bok choi into December, but the three days at 8F temperatures took care of that. As usual the survivors were garlic, onions, and kale, all of which did just as well outside the tunnel. Some chard died to the ground also, and is coming back, but not eating size yet. So we regard the effort of construction as not having paid for itself so far. A lot of hand-picking of slugs is ongoing, too. Outside the tunnel they seem to be hibernating mostly, but the eggs on the inside all hatched. They love to crawl up onto the plastic at night, where they are easily enough collected and fed to the chickens, but it's yet another chore. The storms did throw the under-built tunnel around a bit but did not rip it down; some commercial operations actually have had more damage than we did. You can see in the image that we've tucked various kinds of struts into the roof, and braced two of the fence posts in the north wall. We also go round and tighten the wires as they stretch. The good news is that the hoops have not tried to lift out of the ground. Probably putting in more hoops would improve the appearance of things as well as add strength. We have laid down some lettuce and chard seeds in a flat but the slugs are a concern; might have to commit to baiting them. We'd capture a couple of chickens and keep them in there for an hour or so, but they'd be just as fond of the kale as of the slugs. It's interesting to hang out in the tunnel during a heavy rain; there is shelter, there is some warmth, the sound lulls one mightily. The temptation is to lie down in the straw, pull some of it over oneself, and dream -- to rise up, perchance, a generation hence and astonish the villagers no end. The potting shed, so called, is one of the places things end up that have no place elsewhere at the moment -- a catch-all. By the time of the year -- for us, January -- that we begin taking an interest in making starts, the place is jammed with doodads, empty feed sacks, leaky hoses, bird cages (bird cages?? ), hamster waterers (hamster waterers?? ), broken hoes, and half-opened bags of whatever. So it's time for our "spring cleaning." The poultry barn, of which the potting shed is the western third, was, until 1993, Former Proprietor's hangout away from the house -- we gather he needed one badly -- and it was here he doctored his little fishing boat, made sinkers, and strewed beer bottles and odd magazines about. It was merely a roof and three walls of found materials, open to the north, and about as musty and rat-attracting as a shed could be. When we moved in, the neighbors, who had been Former Proprietor's neighbors for a generation or more, came smilingly over to the fence. Mr. waved his hand at the house, and said, quite, reasonably, "You oughta remodel that place with a match." Mrs. pointed pointedly to the shed, "...but at least you'll take that thing down -- promise?" We mumbled something appropriate, but when it came time to actually tackle the shed, we discovered that its rafters were massive eight-by-ten timbers. So instead of demolishing it, we re-roofed, pulled off the walls, framed in some recycled windows, sheathed the whole place in recycled fence boards, partitioned it into a "barn" side and a "toolshed" side, made a couple of plywood doors for it. All this took a couple of years, whenever we weren't doing something else. We also were given a chimney (on a high and steep roof) if we would take it down, and while that was frightening to do, we got a nice truckload of antique bricks that just covered the bare tool shed floor nicely, in a traditional herringbone pattern. Then we painted the whole thing barn red with green trim. The finished project elicited no comments from next door, and they didn't stop speaking with us, so we conclude the results were satisfactory. Eventually we were given a set of sliding glass patio doors, and opened the south wall of the tool shed and built on a small greenhouse. So the "tool" shed became also the "potting" shed. This worked reasonably well for a decade or so, though the massive spring cleanings had already become necessary. Meanwhile the post at the southwest corner, which had an advanced case of dry rot all along, began slacking off on its job and the whole building began to march slowly toward the creek! When the strain burst one of the double panes in one of the sliding glass doors into a thousand or more shards, it was ... time to regroup. Using an old screw jack on the ground and a tall two-by four tucked between the jack and the top plate, we've lifted the building corner, set a stone under the rotted-off post, and then spent the last three days sorting, clearing out, and re-designing. The greenhouse is less vital than in days gone by, for we now have a starts rack in the west window of the dining room (less susceptible to mice) and we have the grow tunnel. So the south wall has been pulled back under the roof line, vertical once more, but it is still a window-wall with a sunny bench space more convenient to our old bones than the greenhouse layout, which required much bending and arms-extended lifting. Since we don't tend flats in this location nearly as much as we once did, the temptation to throw odds-and-ends in there is as strong as ever. But it's the best place to throw dirt at pots to the tune of Mozart. Sharon Astyk and Aaron Newton, in their terrific book A Nation of Farmers, note that relatively few Americans know how to cook anymore, and describe five basic skill areas everyone needs to cultivate: soups/stews, salads, stir fries, pastry with fillings, casseroles. Cool! To me, though, these are almost all one skill area, but then I'm a vague sort of cook. Mostly I just dice things up and then follow my blind food muse. If I bring stuff in from outside and some of it's green and some of it's white or red, I might sit down and eat that, and there's your salad. Or I put it in some water or stock and puree it with spices or simmer it on the woodstove, depending on the season then, yep, it's soup. Or I steam some rice, oil up the wok, cube some tofu and throw in the rice and then the green and red and white stuff at the end, there's your stir fry. (They mention the wok is not suited to "modern," that is, electric stoves, but if I flip the ring so the wok almost touches the burner, it seems to do OK.) If I soak and then crock-pot a bunch of beans and add the white, then the red, then the green stuff towards the end, that's kind of like a casserole, I think. Sorta. Or I might take the stock, some leftovers from any of the above, or just bring in a little of the red and green and white stuff, dice it up even smaller and throw it in a big bowl with some salt and molasses and honey and yeast and a cup or two of flour, and let it sit behind the stove for a few hours, and after it has grown some, add more flour, and shape it into loaves and bake them, that's bread. I'm much more successful with this than the pastry thingies Sharon and Aaron talk about. For variety, sometimes I leave out the leavening and fry this stuff, and it comes out as decent pancakes, looking a little like what we used to call salmon patties. You can emphasize different things -- potatoes, for example -- without having to worry too much about recipes. But we like having loaf bread on hand. Most of our loaves are wide, round, and flat; you could just rip off hunks but we tend to slice, sometimes in sections like pie. Beloved toasts her slices until it sets off the smoke alarm, then has them with fried eggs. I prefer mine straight with a bit of butter and fruit preserves. I often start with an apple from the new cold room; apples were a disaster here this year and only one of the trees produced really well -- and it's the worst keeper. So we made dehydrated apple slices, and applesauce, and cider, but there were a lot of going-to-get-mushy apples left over and against my better judgment I individually wrapped them in newspaper and put four boxes full in the cold room, which isn't cold enough this year (today we're at 56F outside). A lot of them have inhabitants who have tunneled around in them ever since. So I take up an apple and cut it in half to see whether it's "good" or "bad" or has a "good" half and a "bad" half or whatever, and decide: compost, chickens, or me. If it's good enough for me, do I want it raw, or diced up and used in something? Salad? Bread? You can puree fresh apples and hide them in soups and such, too. But today we're making bread. This is an elephant garlic bulb that came up in the orchard. It's a little sloppy from the big freeze, but I cut the roots off and the greens, and as I'm washing the greens, slip the bad bit off them, and I'll dice up both the bulb and the greens to go into the bread. You can hide fresh garlic in soups and "casseroles" too but don't overdo it in the stir fries -- onion it's not. The bad bit goes into compost. Remember, trash cans and garbage grinders are not your friends. Keep everything you don't want for the birds, and everything they don't want for the gardens and your trees. You won't ever need to buy anything from the chemical companies. Let's throw in some walnut bits from the last of a bagful a friend traded me, and grind a cupful of wheat berries, barley and amaranth, just because we feel like it, and toss that in too, with some rolled oats. Molasses, honey, salt, eight cups of lukewarm water (for four loaves), a 10 oz. rice-bowl of WW/spelt flour, mixed. [ed. ... and yeast! Don't forget the yeast! ... told ya I was vague.] Bash everything around a bit and set aside in a warm place. We keep a set of steel shelves by the wall behind the woodstove for this, as well as for drying shoes and gloves (uh, not on the same shelf). Now go build a new seed-starting rack for the west window, with full-spectrum lamps. Three hours later, come back, say "woo! Better do something with this," grab the bowl, haul it back to the kitchen, dump five or six more little bowls of flour into the big bowl, and stir with a wooden paddle till the mass "rises off the bowl," that is, sticks to itself in one lump that doesn't try to glom onto you when you pat it. The house is only about fifty-five degrees right now, as I'm not burning any more wood until this evening, and to be sure the bread will rise, at this point I pre-heat the over to 200 while I cut the batch into four sections with the knife. After greasing two industrial-size cookie sheets, I shape four loaves on a floured cutting board, turn them over, shape them some more, put two loaves on each sheet, turn off the oven, put the loaves in to rise and go play with the little plant nursery some more. After an hour or two I peek in the oven. Uhhh, OK, those are huge, let's bake! Set to 350F (which is probably 325F in this oven), look at the clock. 3:40, take out at 4:40. More or less. Usually more, 62 minutes. Your oven will differ. Pull the racks from the oven, turn over a loaf and look at its bottom. Should be well browned and respond to a thumping finger like a drumhead. Set on cooling rack. Sneak a hot slice. Butter it. Bite. Like it so much you burst into quiet tears. Currently I'm taking water sprouts out of the plums and apples and rerouting a section of fence in the north pasture to give the mixed flock a little more room. It took the chickens very little time to discover their new empire, and they piled in all around me, taking the tops off the surplus turnips and scratching up remaindered garlic bulbs. It took another half hour, as usual, for the ducks and geese to catch on. The idea is to have poultry wherever there is orchard, and orchard wherever there is poultry. The birds eat bugs that are wintering beneath the trees, as well as snails, slugs and weed seeds, benefiting the trees. Any fruit that gets past us at harvest time becomes available to the birds without having to be gathered and taken to them. Ducks and geese are more compatible with the orchard than chickens, because they don't dig about the roots to make dust baths, or throw mulch all over. To me, eight chickens are like eight small atomic bombs. They can lay waste an organized garden in the blink of an eye. To keep mulch in place and roots unexhumed, I have to cage each tree in its own circle of welded wire. Also, the new fence has to zag and zig several times in order to accomodate the compost heaps, which are right on the fence line, and I want to exclude the chickens from them. So as not to buy new fencing for this project, I'm piecing together sections of fence that were rescued from the blackberries in the south pasture last week. It's labor, but it's good for me, and once it's done you don't have to mess with it for awhile. The last place these fence sections served us, they stayed put for sixteen years. Some of the prunings will be made into smallwood and the smallest of that will be bundled for quick fire starts. The leavings will be cut up also and be distributed around the fruit trees, inside their enclosures, as part of the mulch. Later in the year, these sticks will be covered with straw and grass clippings, and the trees will be served buckets of enriched water hauled from the duck "ponds" -- kiddie pools -- once a week or so during the summer drought. With the deep mulch they seem to need no other watering. Beloved has also taken advantage of the clear, warm weather -- is it the January thaw already? -- to muck out the barn and the Annies' (Ancona ducks) shed and renew the straw bedding. She disturbed a very large pack rat, which came out the barn door blinking in the sunshine, ran over to the gate, bounced off, ran in circles a bit, and went back to bed. These things can be amusing, but they eat a lot of feed. So we are going to have to think of something inhospitable to do to about the pack rat, especially as we need to tighten security next month. The Annies, a drake and five hens, are supposed to breed. That, according to the experts, will be in February, when their egg-laying begins again (unlike our Khaki Campbells, who lay year-round). Beloved built nesting boxes in the shelter and then introduced the Annies to them; they turned to her dubiously, as much as to say, "so, like, what are we supposed to do with these?" "You know, for when you get all broody and such." "Uh, huh. ... what's 'broody'?" But she hopes they will get the idea eventually. Passing by my fence weaving, she brought six wheelbarrow loads of soiled barn litter and dumped them in the garden. On beds five and six. "Hey! Y'know, when I do this, I go along with the wheelbarrow and distribute evenly over all twenty-three beds." I waggled my fingers to demonstrate the tedious process. "Uh, huh, well, you had two months to clean out the barn and do whatever you wanted with it -- snooze, you lose." She wheeled away, chipper as a bluebird. "But, but wait! What are my beds gonna use?" "The compost heaps, of course." Actually, she's right. I do the early plantings. Bed six is to get blueberries and bed five is slated for hot weather to get its eggplants, tomatoes and cukes. So there is time for the chicken manure to rot down a bit and lose its pathogens -- not an issue with the compost. So how come I still feel like I got ... snookered?